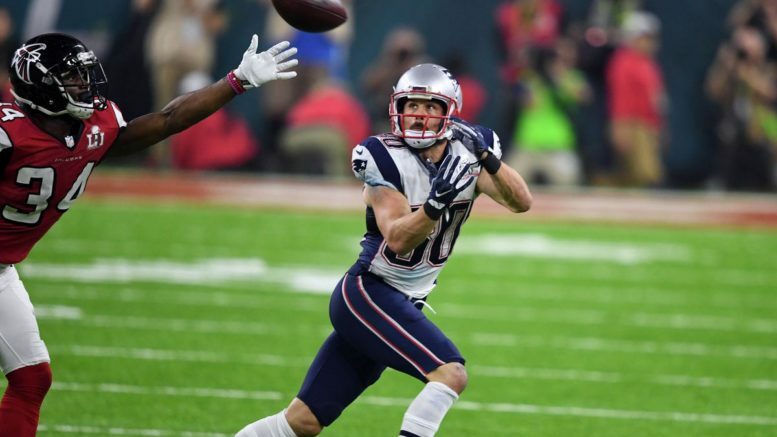 Danny Amendola stepped up in the absence of Rob Gronkowski against the Jaguars, and is one of a zillion weapons Tom Brady could use as the Patriots go for 3 out of 4 Super Bowls for a second time. Let me just state for the record that I hope this headline is wrong. I hope that the words echoed by Chris Berman in last night’s wonderful, once-in-a-lifetime NFL PrimeTime reunion show, are not actually true – “we’ve become numb to the Patriots.” But if it is in fact the cold reality of 2017, then the city of Philadelphia is about to experience a whole new level of disappointment (and that’s saying something). I jokingly asked myself watching the Eagles’ rout of the Vikings: will Philadelphia be more dangerous if the Eagles win or if they lose? You’d think a victory would be the obvious choice, but you may recall how Vancouver handled losing to a Boston team in a winner-take-all title game earlier this decade. But, sadly, the heartbreak kids of the northeast may be in for a rude awakening. Rewind the tape a dozen years, and the script is eerily similar. It’s so similar, in fact, that it’s downright cringe-worthy. Most of the names may have changed, but the plot remains the same. The New England Patriots, despised by most and feared by all, enter a Super Bowl facing the eminent departure of their elite coordinators against the Lombardi-less and star-depleted Eagles looking to win a third championship in a four-year span. In 2004, it was Terrell Owens. In 2017, it’s Carson Wentz, Jason Peters, Jordan Hicks, Darren Sproles, and a few others. Nick Foles once threw 27 touchdowns to only two interceptions way back in 2013. That is a year of efficiency topped by – who else? – Tom Brady, when he went 28:2 in 2016. But Foles is no Wentz, and back on December 10 when Wentz was sandwiched between two Rams defenders and tore his ACL, I just shook my head while having nightmare flashbacks to Derek Carr’s broken leg a year earlier that sent the tomato can Texans, led by Brock Osweiler, into Foxborough as yet another sacrificial playoff lamb. Once again, the path to a championship became crystal clear for New England. Give Philly credit. Doug Pederson and his assistants thoroughly outcoached and outclassed the Vikings, and the Eagles have the kind of aggressive persona that could give New England trouble. They don’t strike you as the type to get up in their own heads, but that’s easy to say now before they’ve ever had to face the Patriots. In the teams’ history against one another, it’s been pretty one-sided in favor of New England, as has been the case with basically the entire NFL in the 21st century. The Eagles beat the Rob Gronkowski-less Patriots in Foxborough two years ago, 35-28, behind three return touchdowns. Believe it or not, the 4-7 Eagles actually rallied from 14 points down early to pull off that stunner. But this is February football. Three years ago, the most innocuous play of the Patriots’ season was the one that convinced me that they would undoubtedly win it all. After a Dominic Raiola penalty gave Bill Belichick ammunition to run up the score, the Patriots stuffed an additional touchdown in the Lions face to turn a 27-9 score into a 34-9 lead. To most, that meant nothing, but to this so-called “conspiracy theorist,” it meant much more. 14 years to the day that Lord Brady made his NFL debut in a loss to the Lions, the tables were turned – literally. The score the Lions won by that day in 2000? 34-9. It’s extremely fair to wonder if Belichick knew exactly what he was doing, because if there’s any coach who is enough of a savant to pull a move like that, it’s him. This time around, it’s almost impossible for me to see New England not capitalizing on this perfect circle-of-life moment to (further) cement a dynasty that will never be matched, and may not even be challenged for the rest of our collective lifetimes. Brady can match Michael Jordan as team sports legends with six championships, and do so in the kind of child’s fairytale way that the Patriots only ever seem to do things. The more we hype up Philly as “just the kind of team that could give the Pats fits,” the more I am convinced they will go full Falcons and Jaguars in Minneapolis 13 days from now. Brady and the Patriots feed on your hatred, and when it comes down to it, they are like the crush that leads you on for months, flirting endlessly and promising a lifetime of happiness, only to tell you they’ve found someone better. Or, if you’re a foodie, the Patriots are the buffet you stumble upon, the only person in a room of 40 trays of your favorite dishes. Just as you are about to dine, the Maitre D’ storms in and promptly ushers you out of the restaurant before your first bite. The Patriots love challenging themselves. After all this winning, ordinary life and ordinary wins have become boring. Hence, last year’s 28-3 rally, and yesterday’s double-digit comeback against the Jaguars. All the halftime and fourth-quarter adjustments will leave Eagles fans shaking their heads, and possibly more dangerous activities, on February 4. It will be the third time Eagles fans have experienced this heartbreak, the second to the Patriots. New England has a habit of repeating history, and it never has a shortage of willing partners. The Eagles know all too well what it’s like to be the final victim of a dynasty. Be the first to comment on "3 out of 4 twice? Eagles could be the perfect patsy"